Let me start this review by saying that I will never be able to do The Final Empire justice. In fact, it’s a pointless endeavour to even try and comprehend my thoughts, let alone to write them down coherently. But I'm attempting to write this review for one simple reason: if you read one fantasy novel this year, it needs to be this one. MY THOUGHTS: The Final Empire is everything I love about fantasy. In fact, it’s everything I love about reading. Within this novel, Sanderson has created a world that manifests in the reader’s mind, a crew of loveable underdogs who fight vehemently against the totalitarian leadership and a new type of magic that will leave you in awe. From the world building to the character development, from the plot to the prose, The Final Empire had me engrossed throughout. The magic in The Final Empire was intriguing indeed; I half expected to fall asleep that night into a slumber laced with mist and swarms of blue. Sanderson has created a wholly unique and endlessly fascinating system of magic, one that the reader can't help but enjoy. Not to mention, the magic was incredibly well-explained and detailed, with different snippets and elements being slowly introduced throughout. Sanderson's system of Allomancy and concept of the mistborn was original, gripping and easily one of the best elements I've ever seen in a fantasy novel. As for the characters: Kelsier, oh, Kelsier, you're definitely a new favourite. Perhaps, I'm just easily impressed by any protagonist who's a criminal mastermind with a strong sense of humour… but, that said, there are still plenty of other reasons to adore Kelsier. First of all, he's the definition of an antihero – forever scheming and plotting, you never know his motives or where his loyalty lies (or at least, not to begin with). He's also a compassionate fellow, one who takes Vin under his wing and mentors her. The almost paternal relationship he had with her uncurled into something beautiful – definitely a highlight. And then there's just so much more I could say about him; the brilliance of his relationships with others, especially with his brother and the rest of the crew; his sheer determination, perhaps his most admirable trait; his backstory, definitely one that'll have you intrigued; and just how incredibly well-written he was towards the end… Sanderson obviously cares about Kelsier to have written him with such credibility and force at the climax of The Final Empire. But as much as I adored Kelsier, the brilliance of the second protagonist is why this duo worked so effectively. I mean, can I steal Vin to be my best friend?! Amongst the abundance of teenage heroines in the fantasy genre, Vin is easily one of my favourites. She's just driven by this dose of sheer curiosity, she has the most heart-wrenchlingly painful background story and is so easy to root for. Not to mention the progression you see within her is empowering to say the least. The admiration with which she regards Kelsier is simply heartwarming and the friendship between the two was surprisingly beautiful. But my character raving doesn't end there because the secondary characters were brilliant too. This crew of criminals – each with different powers – fascinated me to the point I wanted to shed a why-don't-they-exist tear. Breeze, Yeden and Ham had me chuckling throughout (“You should try not to talk so much, friend. You'll sound far less stupid that way”) and I couldn't have admired their determination any more. Elend grew on me as the novel went on (“My behavior is nonetheless, deplorable. Unfortunately, I'm quite prone to such bouts of deplorability – take for instance, my fondness for reading books at the dinner table”) and Sazed was a constant source of knowledge. And then, of course there's the added bonus of the antagonist: the Lord Ruler may sound far from human, but Sanderson had this wonderful way of humanising him throughout. Of course the readers are still supposed to hate the Lord Ruler, but that's not to say I didn't enjoy the insight into the mind of a villain. What else can I say? The rebellion was one I genuinely cared for and the switch between the alluring, high society balls and stowed away, secret meeting rooms was intriguing to say the least. The pacing was perfect for a reader like me – someone who loves to know about every element of a world – and the action scenes were so cleverly combined with Sanderson's system of magic. The romance was very subtly done and, although there wasn't much of it, it worked well. All in all, The Final Empire left me in complete awe. Like I said at the beginning of this review: if you read one fantasy novel this year, it needs to be this one. I don't think I've even heard of this before, but a five-star review from YOU is most definitely enough to make me want to read it! Plus, it sounds fantastic - definitely "everything I love about fantasy" too. Lovely review, Ruby, and now I am off to add The Final Empire to my wishlist. Hehe thanks Maya. ;) It's truly fantastic – like, easily one of my favourite fantasy novels! I think you'd really, really enjoy it. *Sigh* Brandon "FREAKIN" Sanderson!!! I mean, that all that needs to be said. Great Review! 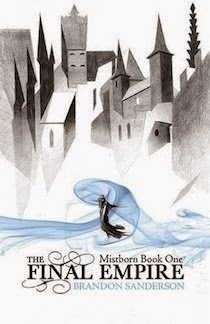 I got to get the Mistborn Trilogy box set......and soon! Have you read his massive, behemoth of a book, The Way of Kings?? I'm thinking about starting that soon. Oh yea, and if you love Sanderson...try Scott Lynch and Patrick Rothfuss! GREATNESS! This sounds so good! Your reviews are so skilfully and beautifully written that I always end up wanting the book in question! I love books that complete envelope you in a completely, different world - especially if it's fantasy. I'm also liking the sound of Vin and Kelsier's relationship. I read mist born in late 2013 and absolutely loved it. It was the first work I read from Brandon Sanderson and I really put him high on a pedestal after finishing it. The characters, the setting, the plot, it was everything I wanted in a book.